What ties together Bride, Port St. Mary and the Nunnery with a saint and a witch, at the start of February? Laa’l Breeshey, or Breeshey’s Day. ’Breeshey’ is the Manx form of ’Bridget,’ the Irish Saint who famously laid out her cloak, which miraculously stretched to cover enough land for her nunnery. 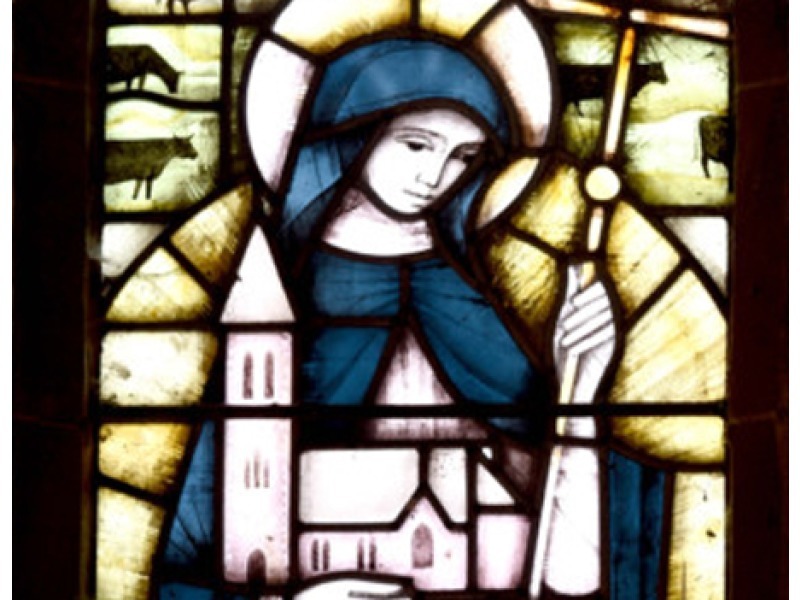 Hers is the name behind Bride (the church, village and parish), and it was also believed that it was Breeshey who founded the Nunnery, having come to the island to receive the veil from none other than St. Maughold. ’Vreeshey, Vreeshey, tar gys my hie, tar gys y thie ayms noght. In the morning, if the food and drink tasted and the bed slept in, it was a sign that Breeshey had visited and your house was blessed, so you could look forward to great luck and fortune ahead. This was, however, open to abuse, as at least one story tells us. Edward Faragher, the poet of Cregneash, tells of the woman of Earyween, a farm high up the Baldwin valley, who prepared correctly for Oie’ll Vreeshey. However, unknown to her, a Jurby man was passing in the night and couldn’t resist the free food, beer and bed. He had already gone by the time she emerged in the morning, allowing her to believe that Breeshey had visited and her luck was made. She carried this belief to the grave, as the man was too ashamed to tell the true story until after her death. We recently released a video on the Culture Vannin website and YouTube of Ruth Keggin telling this tale, in the very place where it happened. But what of the witch? It was believed that the Caillagh ny Groamagh (roughly translated as ’Gloomy witch’) was thrown in the sea in Ireland and drifted here. On the morning of February 1 she landed at Port St. Mary where she hunted for sticks to light a fire to dry and warm herself. The area she landed used to be known as Callie or Caillagh Point, but has today become known as Kallow Point. It was later believed that she once lived on the exposed slopes of Cronk ny Iree Laa. So the legend goes, it is hoped that every ditch will be full of rain or snow on the first morning of February. This is so the caillagh cannot start her fire, and only then can we can be sure of a good spring. So, whether you’re leaving out food on 31 January, or hoping for rain on the morning after, Laa’l Breeshey is another great day to reflect on our own special Manx traditions and beliefs. The article can be enjoyed on the Isle of Man Newspapers' website here: Laa'l Breeshey, and the story of the saint and the witch.